Raise a Mug to the Irish! Is there a drop of Irish blood in my veins? I doubt it. I grew up Mennonite in the Longenecker family in Pennsylvania Dutch country, a hot-bed of Swiss-German ancestry. Still, the Irish-named Donegal Springs is a mere 3-mile, 5-minute drive from Rheems, Pennsylvania near my birthplace. In the adjoining Dauphin County are Londonderry Township. In Bucks County, a town named Dublin, sister city to the capital of the Republic of Ireland. When we visited Ireland, we met a congenial gentleman named Buchanan, who remarked that he has immigrant relatives buried in the Donegal Presbyterian Church cemetery, a place he once visited. During my last trip to Pennsylvania, I discovered some vintage postcards stamped with penny postage, sent to Miss Fannie Martin, my Grandma Longenecker. Many of her postcards are embossed and saturated with color – no Photoshop filters needed. 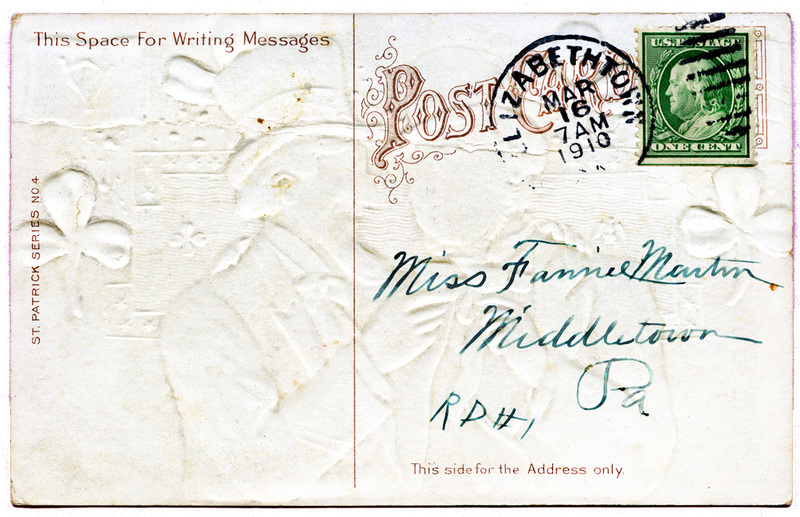 In an era long before smartphones and text messages, postcards were valued. Instead of instant messages easily deleted and forgotten, these cards have become artifacts of my family history. The one below over one hundred years old is dated 1910. I live in a neighborhood where Irish names abound: Blarney Stone Court, Killarney Drive, Leprechaun Court, St. Patrick Lane. Names on residents’ mailboxes have included Dunleavy, O’Neill, and Kelly. We once had to fight a major retailer to retain charming shamrocks and moss-footed oaks in a wooded area adjoining our community. The hanging on our front door reflects the neighborhood and the season. St. Patrick’s Day this year falls on a Thursday, March 17. Until then, I wish you the luck of the Irish. May the wind be always at your back and your pathways peaceful. If you are Jewish, Mazel Tov! You expected this line to be __________. And was never allowed any _________. He chucked Math and took up _________. Who swallowed six packets of seeds. And he couldn’t sit down for the_______. Edward Lear, Ogden Nash, and Lewis Carroll are among the best versifiers of this humorous form. If you want to cook up your own limerick, here is a link to the recipe with a pattern for the rhyme scheme. How much fun is this? I’ve written many forms of poetry, but never a limerick. Working on one now! 🙂 May the wind be always at your back too. Oh, please post your finished limerick here. Others will read and be inspired too. Thank you for starting us off with such positive energy, Pamela. But her stories floated like light. You have raised the bar on limerick writing. Thank you for the effort, Pamela! But sure fun to try and master another form of poetry. I imagine you’ll be seeing a lot of green on 17th Marian., food, drink the lot. I enjoyed the limericks but have to admit that The Trinity, Infinity ? has me stumped this morning. Because I have such smart readers, I tried to pick one challenging limerick. If you can’t come up with a match, I’ll provide the answers next week. I’m sure Jacksonville will have lots of food and drink tinted green. Savannah, just a few hours’ drive to the north of us goes all out though. 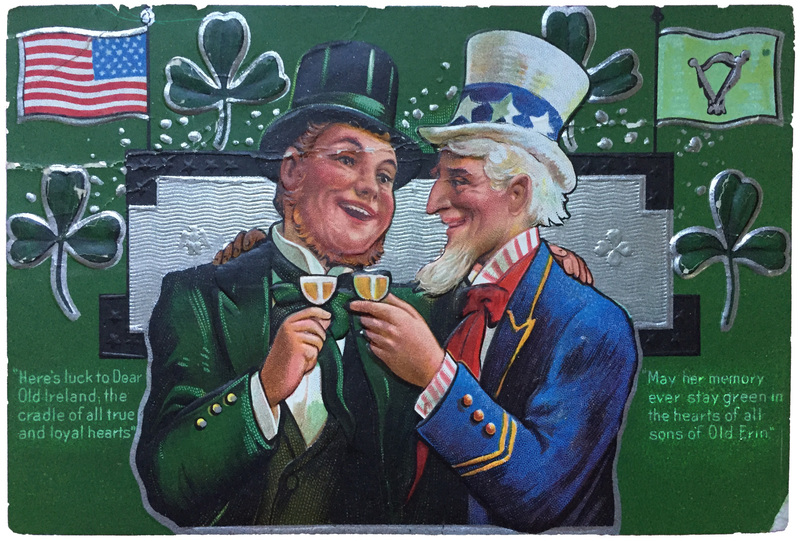 They have a high concentration of Irish, and the whole city spends St. Patrick’s Day celebrating with parades and other festivities. Huge hugs back to you, David. Not a drop of Irish blood here either, Marian. 🙂 We’ve been in Philadelphia on or near the holiday when we’ve had to dodge drunken revelers in green. The limericks were fun. Like David, I was stumped by the Trinity/infinity one, although I came up with one possibility. Not sure if it’s correct though. Do you ever listen to “Wait, Wait, Don’t Tell Me” on NPR. They do a limerick challenge based on the week’s news. May the wind be always at your back, as well! Yes, I do listen occasionally to “Wait, Wait, Don’t Tell Me’ Saturday mornings on NPR. Maybe this week’s political news will be tied in with a reference to St. Patrick’s Day. I am pretty sure I got the answer right to the Trinity one, and to the others. I listen to Wait Wait don’t Tell Me also. It is a very enjoyable show. I like the part where you have to guess which is the correct out of three “far-out” news stories…they are all 3 so unusual it is hard to pick the true one. I agree. And I’m also amazed that the contestants often guess right on the “far-out” news stories. Knowing they are going to be on the show, these people probably pay more attention to trivia in the news than I do. I’m of Canadian Ottawa Valley Irish heritage. People take week-long vacations to celebrate St. Patrick’s Day where I come from. Fiddle music and green beer and lots of laughs. How enlightening, Arlene. Do you live in Ontario near the capital city? Most of the festivities in the States that I know about are limited to a day or a weekend. Week-long vacations probably give a huge boost to the economy. Thanks for stopping by today. Yes, I live in Ottawa now. Back then people didn’t worry too much about red dyes or green. Right? In our Pennsylvania Dutch community I remember wearing a green derby hat at school for St. Patrick’s Day. Now I can’t remember whether I bought it or it was given to me. My teacher/aunt Miss Longenecker went all out for holidays and her students celebrated to the hilt. Thanks for your reminder of “the good ole days,” Jill. Not an ounce of Irish blood but when young you’d think all us Latinos came straight from Dublin lol. We’d live it up green dress up and Irish parties bar hopping for all the green drinks around. In Chicago they turn the water green. I have an attorney’s appointment downtown Chicago in front of the green lake. I’m sure it will be fun because it is my husband’s first time to see it. Enjoy your week. Visits to the attorney are usually not much fun, but green decorations and festivities already beginning will take the edge off. I guess you are referring to Lake Michigan being dyed green. Enjoy your week too, Gloria. The middle of my 5 sons was born on St Patrick’s Day. His father’s ancestors are Irish on his mother’s side (her father came from Ireland) I also have Irish in my ancestry, though I can’t nail it down. Being born on St Pat’s Day, his second name had to be Patrick. He doesn’t like the name, but he has a shamrock tattoo, and always has green beer or Guinness on St Pat’s Day. :-). Obviously it’s his birthday next week. I can hardly believe that he will be 40!! You have a son Patrick and I have a grandson with the same name. Lots of Irish in his ancestry too: Irish names like Dalton and Conley figure in his ancestry. When my mother was in her 90s I remember her saying she could not believe she had such an old daughter, an observation I found amusing. Like you, I feel the same way about my children, both in their 40s now. Happy birthday to your Patrick and for all the celebrations around it. No problem with picking colors for decoration. Ha! Yes, David and Merril were wise enough not to post any spoilers. You have probably guessed many of them though. Hold your breath until next week, Anita. Have a wonderful day! When you say your husband lost his accent, I get the impression he’s a first generation Irishman. Right? Fortunately, you’ll probably be hearing a lot of such accents in the media this week. I didn’t know there was a name for it. “Copy chat” is what I do too when I’m in Pennsylvania with friends and relatives for any length of time. When I come back the lilt persists for a short while, but I’m not too embarrassed by it. Marian — And though I’m a Scot, the blood running through my veins probably has a good deal of Irish lineage running through it. Waaaaaaaay back in the day, both the Irish and the Scottish were known as Picts (until there was a wee bit of a falling out). I’m having FUN with your limerick today — thank you! I do remember your posting about your ancestry a few months ago! Thanks for the diversion. 🙂 I did not peek at any one else’s comment. Ha! I hope no one else looks at yours – yet! Thank you, Melodie! Not Irish at all, Swiss-German, same as husband. We also don’t live in an area with any appreciable Irish population, mostly German and Polish and Swiss. Though there are plenty of ads in the papers with St. Patrick celebrations and promotions for alcohol/liquor which seems to be the main idea. MAN with Maureen O’Hara and John Wayne. I will watch it sometime soon. I do make corned beef and cabbage because we like it. I will buy several actually and cook them at one time. We often have corned beef hash for Saturday breakfast and I pack the leftovers into the freezer for that purpose and some sliced for Reuben sandwiches. I was actually looking at the store fliers to see prices for the corned beef this year. 2.99/lb seems the lowest. I have never tried making it from scratch though I read it is not really that hard, and I am not interested in doing so. Oh, I will make soda bread (with currants) tomorrow and I have already made cupcakes 2 times, using festive papers and sprinkles and little clover picks I saved off some store bought cupcakes years ago. The store sells green colored bagels and rye bread and tortilla chips on occasion, but these don’t interest me. I don’t think I have ever seen green beer. If we didn’t live so far from each other, I would invite myself into your kitchen. I take it you are a librarian, referring to the decorations you have put up on the windows and display areas. Thanks for commenting with menus here and for the tip about the movie. I’ve never seen it, but on your recommendation will check it out. Yes, a librarian. I enjoy it very much. Like your Aunt Ruth, you know how to use the calendar to capture your students’ (readers’) attention. I have the same Swiss/German ancestry you have, but I was thrilled to discover that many years ago, we were all Celts. Some of our cousins escaped to the British isles. Isn’t that interesting. When I get the results back from the paternal Hershey DNA test, the closest living person to my brother’s DNA lives in Scotland! I believe you are spending some time in (or near) Scotland this year. Maybe you can do some more genealogical digging there. I’m all ears, looking forward to your sharing the results of the DNA test. I love the Irish! There are quite a few of these lovely folks living in our community in Spain. In fact last year we attended the biggest St. Patrick’s Day event I have ever been to, right here in Spain!! What fun. I had no idea Irish were so well represented in Spain. I’m guessing another St. Patrick’s Day event is in your plans for next week. And covered her head with a lid. I am hoping we can take in some of the festivities but we may be double booked! I love the limerick. 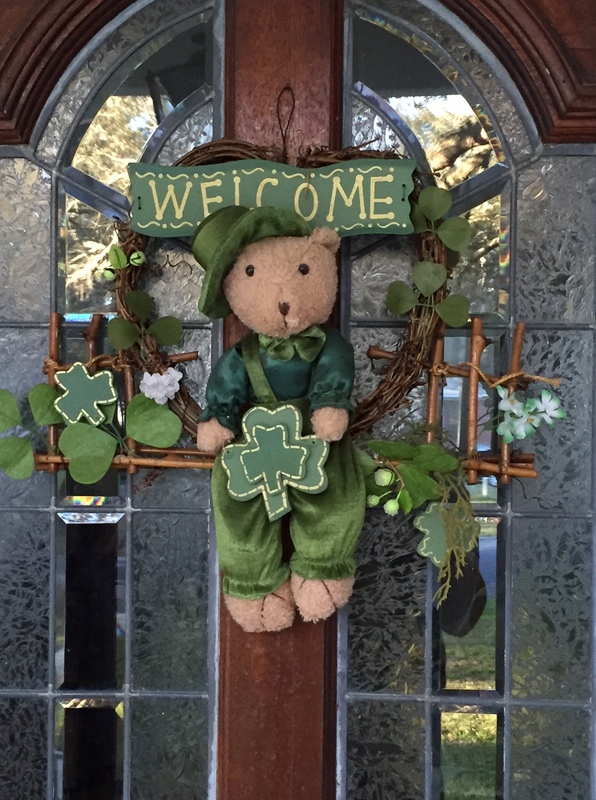 I have a grandson who was born on St. Patrick’s Day. He turns 13 this year. They did not name him Patrick! I’m going to send him those limericks and see if he can provide the missing rhyme. (I won’t send him the first one, as that might not be appropriate for a grandma to send to her grandson). Mind you, we would both be laughing our heads off if we read it somewhere together! I did hesitate a little when posting the first one, but knowing my readers here, decided to go with it anyway. I’m sure 13-year-olds hear much worse in school. Yet we Grandmas have set the bar pretty high when it comes to civility and manners. I like your last line, Elfrieda! My grandfather was half Irish and half Cherokee. His Cherokee mother died in childbirth and his father married an Irish woman with the last name Culpepper. They all had red hair. MY poor grandfather wasn’t treated well by the family because he was a half blood. 😦 But he loved his Irish heritage anyway. Just go shopping or look around your neighborhood, racial mixtures abound. Most people don’t think “half blood” anymore. Your poor grandfather was born in the wrong generation, but it sounds as though it didn’t bother him too much. Yeah, he had his group to identify with in his era, and despite his experiences as a child was fairly racists against blacks. He grew up with that, too. I wonder if he (or a composite of him) appears in Red Clay and Roses. Hmmm . . .
Only as a bystander when Sybil goes to her Aunt’s for Christmas. Such fun! My husband has lots of relatives in southern Ireland. What a fun post, Marian! I’m still laughing. Jim and I have no Irish blood, but we have the most important connection: our grandchildren. Our daughter has red hair; she married a red-headed Irish cop, and both Grace and Gannon have gorgeous red hair. 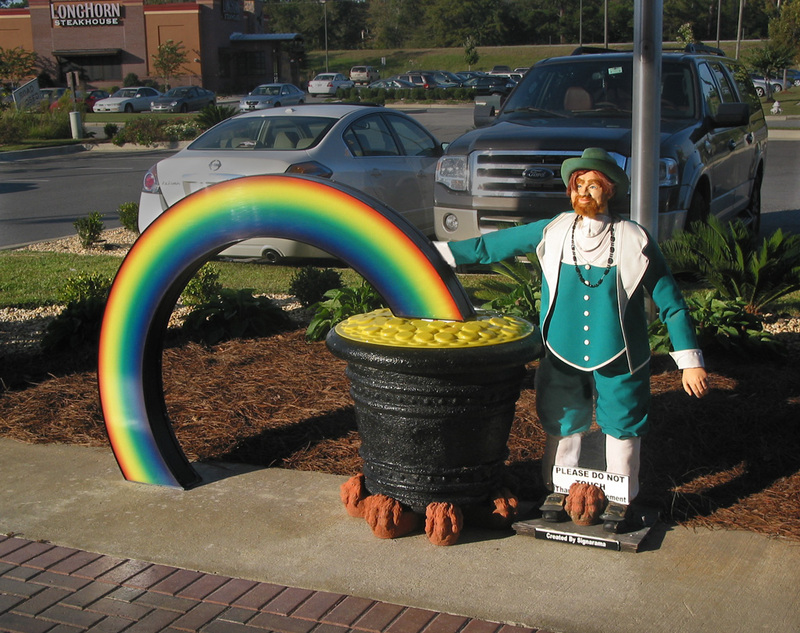 They live in an Irish community, with parades, flags, specialty foods, and lots of limericks. Green is Queen of the colors there! “Green is Queen” has a nice ring to it, suggestive of all things Irish. Because Crista married into an Irish gene pool, we have a red-headed grandson Patrick and an auburn-haired granddaughter Jenna. Perfect! I read somewhere that red-hair occurs naturally in only 1-2 percent of the population, a rare distinction. I’ve just had a birthday mini break in Yorkshire so I’m late getting back . I have Irish blood in me Marian , my grandmother was Irish and my mum and dad were married on St Patrick’s Day 1944 , so if my lovely mum and dad had been around it would have been , hang on , 72 years wow !! I love a limerick such fun and that postcard 100 years old how amazing is that . Happy Birthday to you, Cherry. Yorkshire sounds lovely especially since I possibly see glimpses of it in the fictional Downton Abbey. Here in the States we saw the show’s finale just last Sunday evening. Thanks for commenting, Debby. I take this as a sign you are feeling “betta” now after your bout with the pernicious flu. Thanks for the tweet too! Yes, my sleepy post next week will deliver the answer key. Until then . . . ! Commando is one quarter Irish on his mother’s side but I suppose that is more common here in England. Oddly neither of us has ever been to Ireland and St Patrick’s Day is fairly low key here. We enjoyed Ireland and wished we could have spent at least one more day in the Dublin area. I can still remember the day we viewed the Book of Kells at Trinity College. Lots of fabulous architecture to view as you walk – just your cup of tea!